Since the day they opened for business back in 1995, Buben & Zorweg has been committed to exploring the limits of technology and craftsmanship with exciting new masterpieces. Their latest development is the Magnum luxury safe. 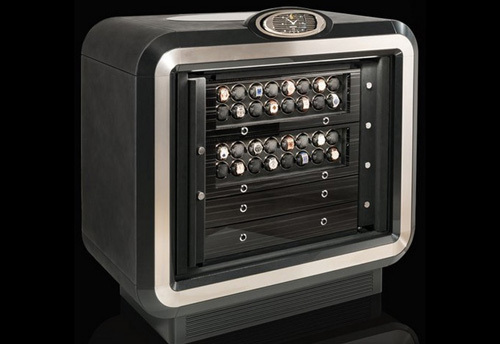 Buben & Zorweg began to focus on security products in 2008 and introduced their first luxury safes that also offered a unique design which became an attractive addition to every elegant interior. The goal in the development of the Magnum Luxury Safe, was to create a product not only that would appear to look secure, but to have the appearance of an object of design. Magnum comes with two handles which visually interprets the character of the safe. The incredible safe doors don’t open outwards, but instead disappear inside the safe when opened to decoratively present its valuable content. It’s apparent that one glance at the Magnum luxury safe an done gets the sense of what high security really looks like. The result if from the intellectual creative process behind designing and manufacturing a masterpiece. Another detailed solution offered is the extendible interior. The safe doors are rather thick for obvious security reasons, which would normally mean for example – an exclusive watch collection strapped to TIME MOVER® units would be located deep inside the safe. But Buben & Zorweg has cleverly turned a high-security safe into an impressive presentation shrine. The end goal of Buben & Zorweg is to consistently search for the ideal solution to satisfy the discerning demands of watch collectors and aficionados of the unusual. For those planning to attend “BASELWORLD“ next year, be sure to stop by and view the Magnum luxury safe from Buben & Zorweg first-hand.